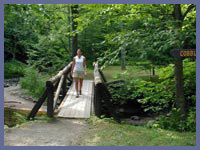 Main Attractions: Running waters, scenic trails, beautiful vistas, long or short hikes, ranger station, camping and fishing. I can't trace the exact calendar day or year, but I can remember the exact day and moment in my mind where I fell in love with overviews. Cobble Mountain, which really is just a good sized hill with nice western views, may not be a big deal to you, but to me it will always be a grand place. Back in the 70's as a boy around 5 - 7 years old, I was able to tag along one day with my eldest brothers and their pile of friends to Macedonia. Usually, I'd watch them drive off...giving them big, sad eyes trying to guilt them into taking me. For what seemed like the longest time, the best I got was a "see you in a little while" or "next time". But one day the puppy eyes work. Perhaps they felt bad for always leaving me or maybe they finally realized that I wasn't a threat to divulge information they wouldn't want "the old man and old lady" to be privy to. The car stopped and someone shouted "hop in, little man!". I bolted to the car and a conveyor belt of hands and arms pulled me through the back seat passenger-side window and placed me in the middle of the back seat, buried in an old station wagon with brothers and their friends. Getting ten people into a car back then was routine stuff. Seat belts? Oh, yeah... those annoying things you shove out of the way and under the seats. (More proof that as the generations pass, society gets smarter.) I would never again be the little guy left behind...I was in! The fact that I was given the worst seat didn't phase me a bit. The thrill of being "one of the guys" combined with the excitement of finally knowing where they took off to was all that I needed. To make a long story short...the rock n' roll, open windows, and loud chatter up Route 7 to Macedonia was totally cool as far as I was concerned. Climbing Cobble Mt. was tough for my little legs and if I wasn't keenly aware of what the bigger guys were thinking of me, I would have probably become a little cranky and whiny. But as we neared the top, I got excited and a second wind took over. I was proud I'd made my first "mountain" climb. Then something unexpected happened. The views just hit me in a big way. The crystal clear skies and rolling hills that seemed to go on and on were other-wordly or cinematic. I zoned out into another dimension like only a little child can. It's one of those things you can't explain - I became fixated by the rolling hills, fluffy clouds, mountaintop breeze, hawks, rocks, and smaller trees. It was just so different from everyday life. From that day on I was officially a hiker and still am today. Back in the '70's, Macedonia was a hangout. Beer drinking, sunbathing, and "fires" of all sorts were burning regularly. Teenagers or college kids ruled. That changed a long time ago. Today, Macedonia is a very nice, clean, well maintained family type state park. No-alcohol policy is strictly enforced and campfires aren't allowed except in designated campfire pits. It's a great place to hike, fly fish in the stream that cuts through the entire length of the park, picnic, walk, camp, or ride a mountain bike along the dirt road. The trail to Cobble is still there, and as good as ever. There's also a long 6.8 mile blue trail loop around the entire park that encompasses Cobble so if you're in good shape you should take that on instead of the short but very steep Cobble trail. It's best to start at the ranger's station and grab a copy of the park's trail system. Besides the blue trail, there are shorter trails that hook up with the blue trail. You can take easy strolls along an old utility road or get a workout by heading up into the hills. All of the different color trails offer great vistas and beautiful natural surroundings. Macedonia is the type of place where senior citizens can get out for a stroll and pass right by experienced hikers who are testing their mettle on the very strenuous 6.8 mile blue trail. It takes a hearty soul to finish the blue trail as it passes over four peaks that are 1,200 feet, 750 feet, 1,300 feet, and 800 feet in height. Some of the terrain is quite rocky and requires a hand up or a bottom to slide down. The main area of the park is snuggled between these peaks and the other smaller trails usually lead to one of mountain tops. For those not into climbing, there are flat dirt and grass roads that are great to explore. I recommend the western part of the blue trail if you decide to tackle a medium hike. It has the best scenery and also is a little more rugged than the western part. When you enter the park via Kent look to the left for blue trail markers a short distance after the road turns to dirt. This is the start of the east side hike. For a short but steep climb, Cobble Mt. trail starts at the wooden foot bridge in the main parking area just up the road from the ranger's station...but don't underestimate the trail...it packs a mighty punch for something short. You'll be suckin' wind in no time if you're not in good shape so just take it slow and rest along the way if you're feeling tired (and don't let anyone in the group pressure you into keep going...stand your ground and enjoy the day!). As you approach the top the views east will come into play. Though not the Rocky Mountains, it's a really nice scene with cozy spots to relax and take it all in. Keep walking over to the right as some folks don't realize there are additional viewing points a few yards up the trial. Cobble Mt. 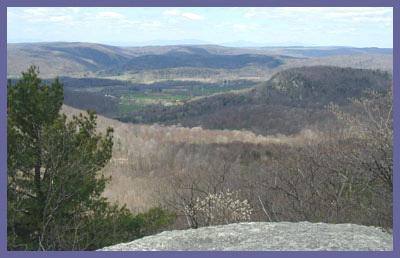 offers a spectacular view of New York state with the Catskills looming in the distance on a clear day. In the past few years forest fires have hit Macedonia and a few large tracts of woods destroyed. The cause of one of the largest fires was a discarded cigarette. Others, improper campfire use. Please you some common sense and put out your cigarette if your a smoker. Don't just flick it off to the side and assume it'll go out - if you're a smoker and you know won't be able to go without, when you're done put it out on a rock and then make sure it's buried completely in the dirt/sand. If not for the long hard hours put in by local firemen (some of them were overcome by smoke and heat exhaustion), surrounding homes could have easily been destroyed as well as a larger swath of forest. Macedonia State Park is a great place and really unique. Help keep it clean and free from all the nonsense that we encounter in the hustle and bustle of modern day life. Macedonia is a five minute drive to Kent center which has all the modern conveniences.